Dragon Wings: Printing with PLA and PVA — . Though PVA filament offers some great opportunities to manage some 3D printing situations, I just don't see a lot of discussion about it. I'm guessing that's because to really get the most use out of PVA you need to have a dual extruder printer. I don't know what the numbers actually are on single versus dual, but my gut feel is that only about 10% to 15% of us 3D printing hobbyists have duals. Personally, I think PVA and other "utility" filaments are an excellent motivation for having a dual extruder printer, not to mention the obvious plus of being able to print two colors of PLA or ABS at the same time. PVA filament has two very useful properties. First, it bonds with PLA as if it actually is PLA itself. Second, it's water soluble. Last year I wanted to print this beautiful copper dragon model that someone had introduced on Reddit. The model was already in pieces rather than a single print, and each wing was a separate piece. The challenge I ran into immediately was that it was hard to orient the wings in such a way that I could get a nice, smooth print. The ideal method would be to orient them vertically, but this was an extremely tenuous way to print. No flat base to adhere to the print bed. Adding even the lightest support made the wings look terrible once the support was removed, and I never think that sanding and filing looks as good as just getting a good print in the first place. So, I decided to try the PVA method. Using OpenSCAD I created a very simple block of plastic around the wing. Exported that block as one model and the wing as a second. 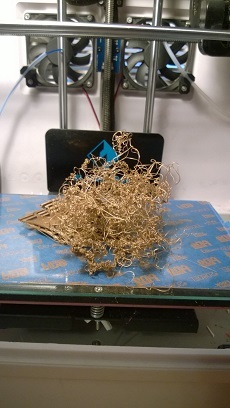 In Simplify3D I told the Dreamer to print the block in PVA and the wing with a nice copper PVA. As you can see in the pic, I really overdid it on the amount of PVA -- I could have made that block significant smaller and still gotten the same support I needed, but…live, learn, refine. Didn't matter. Once the print was done I dropped it in a bowl of water, and within two hours that block of PVA was gone and I was left with a very nicely printed dragon wing. One other hindsight note, along with a warning. I should have divided the print into two processes with one stopping at the max height of the PVA. The second process would have finished the wing and allowed the PVA extruder to cool back down to room temp. That top half of the wing took about an hour to print, and because I only used one process, I had non-moving PVA filament cooking in a 185C extruder. Not good, and probably led to the demise of that nozzle about two months later. Copper dragon with banana for scale. Wing embedded in PLA block. Other applications? How about creating a single-print hinge, where the empty space between the pin and barrel are initially printed in PVA and rinsed out? There are other specialty filaments to consider, too, such as NinjaFlex. Though I haven't tried it yet, I've considered using NinjaFlex in one extruder and PLA in another to create a flexible joint between two objects without having to print separate pieces and snap them together. Also, there are no electrically conductive PLA filaments available. They've still got plenty of room for improvement, but imagine the possibilities of printing your own circuit boards with regular PLA in one extruder and conductive in the other. Arduino/Raspberry Pi hobbyists, eat your heart out. And, of course, there's always the standby of multi-color printing. After all, who doesn't like their name on everything they make?